Sometimes it is so much easier to focus on the negative in life – and work – than the positives. This week I have been reflecting on how awesome my graduate students and postdocs are, both former and current. There is something transformative about working in a lab where lab members look out for each other, champion each others successes, encourage each other through stress, and come to work with a happy, positive demeanor. I am naturally prone to see the flaws in academia, so the lab makes me a more balanced scholar. The event that triggered my feeling of “my lab is the best, holy smokes, I can’t believe these people work with me” was a simple request by a colleague. She had finished a single-authored paper and needed some fresh eyes on it. You know how it is when you have written something all by your lonesome – you can never quite tell if you are making sense. She asked me, and I asked the lab, if they could give her paper a read and send her comments. ALL THREE OF MY GRADUATE STUDENTS SENT EXTENSIVE COMMENTS WITHIN A FEW DAYS. These are all students who are working on their own projects, preparing for comprehensive exams, writing papers of their own. They got nothing for their work other than my and my colleague’s goodwill. If I think back over time, I see a lab filled with students and postdocs like this. The undergraduates who helped train newcomers, the graduate students who have shepherded undergraduates through first research projects (and manuscript rejections and revisions), the postdocs who have spend hours training others on how to collect and analyze data. I know I do my share, but a positive work environment can’t rest on a single person’s shoulders. I am grateful that I have had the opportunity to work with some amazing folks over the years! I wonder, too, if working towards collaboration in our labs – rather than competition – could help make academia a more inclusive place overall. If we can see ourselves as all working towards a common goal with common goodwill, couldn’t we then start to chip away at the -isms (sexism, racism, ableism, etc.) that are plaguing academia today? A cultural mind shift is needed, and it is incumbent upon those of us with privilege to lead the way. And, yeah, I couldn’t resist an opportunity to mention the -isms. Geocognition Research Lab graduate student Patricia (Paty) Jaimes recently attended the Michigan State University College of Natural Science Awards banquet and received the Tracy A. Hammer Graduate Student Award. Congratulations again, Paty! Caitlin Kirby, first-year PhD student in the Geocognition Research Lab, presented at the 2016 Fate of the Earth symposium last week. This was Caitlin’s first poster presentation as a graduate student. She presented on preliminary results from interviews she conducted with individuals who work at the nexus between climate science organizations and Tribes; this is a first step on an NSF-funded project investigating ethical training that occurs at this nexus. She is currently co-analyzing these interviews with an undergraduate (Citralina Haruo) from our collaborator, the Sustainable Development Institute at College of Menominee Nation. Good job, Caitlin and Citralina, and well done! 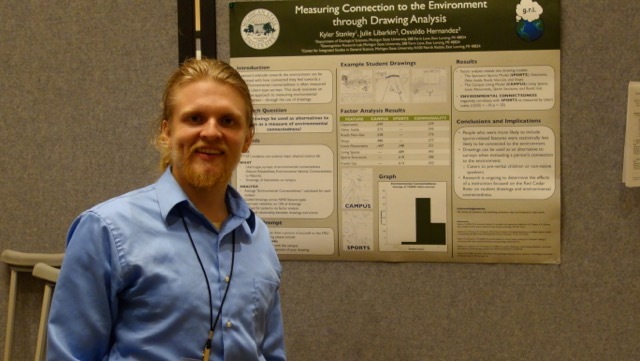 Geocognition Research Lab undergraduate Kyler Stanley recently presented his research, Measuring Connection to the Environment through Drawing Analysis, at the North American Association for Environmental Education (NAAEE). Well done, Kyler!